As a working mom of two little ladies (one born on Christmas Day and the other on January 10), “busy time of year” is the understatement of the season in the Leyk household. Juggling working, gift buying, dual birthday party planning, laundry sorting (and spot cleaning), meal planning, housekeeping, snow shoveling, toddler wrangling, ornament dangling, cookie baking, lefse making, Santa faking, and Elf on the Shelf mischief-making—ON TOP OF holiday hosting—is crazy. Somewhere in there, for the good of the general public, I have to shower. And that, my friends, is the inspiration for this article. 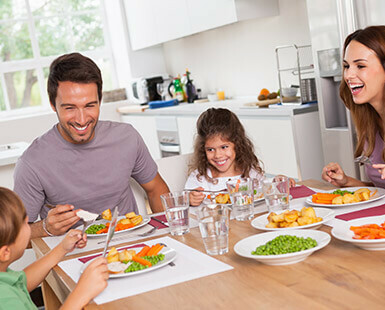 While the holidays are an exciting time of year to gather friends and family to celebrate, it can be an overwhelming season for those hosting, even for those sans toddlers. As if family dynamics, gift buying and mountains of food prep aren’t enough, the pressure is on to also be festive and put-together—even when you may feel like Clark W. Griswold post-exterior-illumination-letdown. Aspirational decorating ideas abound online through resources like blogs, Pinterest and Instagram, but it’s important to remember that little extra sparkle can be kept simple … and even inexpensive. 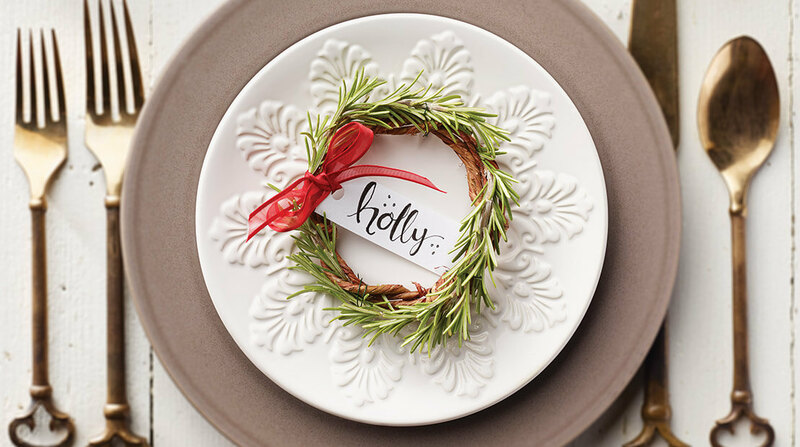 Here are five tips to simplify your holiday hosting to-do list and add a special personal touch to your gatherings with enough time (and energy) left to enjoy your company. 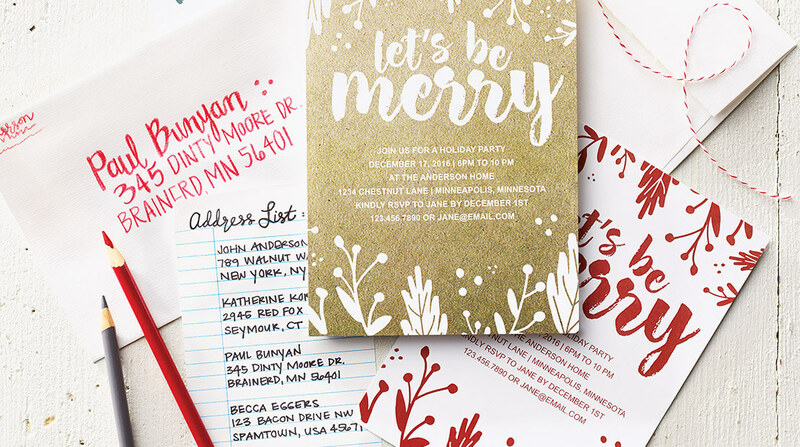 Snail mailed or electronic, invitations are an easy way to set the tone for your gathering and provide information upfront to your guests. RSVPs can help you plan for adequate seating, beverages and food. As you get RSVPs, have the conversation about your menu and don’t be afraid to accept help or even ask guests to bring a dish to share. Most are more than happy to do so, and often will bring something they already know they enjoy, so you’re sure to please everyone involved with the food selection at your gathering. Save non-perishable items for guests coming from out of town if possible. Keep track of what guests are bringing to ensure you have your bases covered for side dishes, desserts, etc. No matter the floor plan of your gathering space, guests have a natural tendency to congregate at the heart of the home—the kitchen. 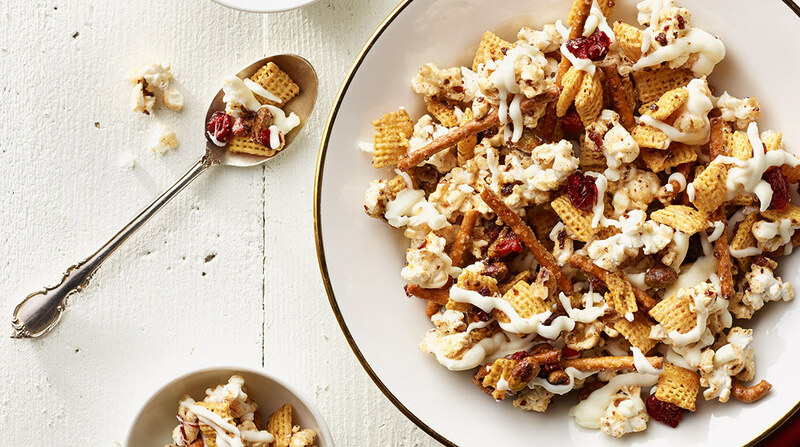 Keep snackers at bay (and reclaim your food prep space) by having a few low-maintenance, make-ahead munchies to set out, such as a snack mix or a party tray. 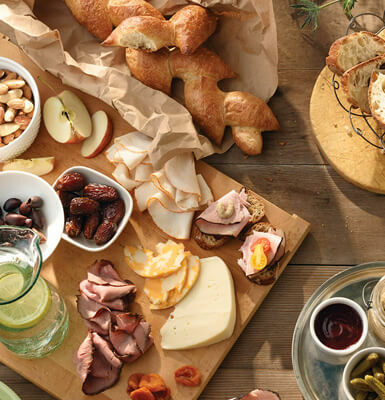 Hormel Gatherings® party trays and snack trays are a perfect way to save you time slicing and dicing—and save your serving platters for the main event! Preparing a signature drink is a nice way to save yourself time and money and add a personal touch and an attractive showpiece to your gathering. Rather than taking individual requests for beverages, guests can serve themselves as needed. Opt for a non-alcoholic punch (that can be added to) so there’s something for everyone. In large bowl, combine popcorn and next 4 ingredients. In small saucepan melt butter over medium heat. Stir in sugar and corn syrup and cook 2 minutes, stirring constantly. Remove from heat. Stir in vanilla extract and pumpkin pie spice until well blended. Stir butter mixture into popcorn mixture, stirring thoroughly to coat. Transfer mixture to 2 lightly greased jelly-roll pans. Bake 25 minutes, stirring every 10 minutes. Remove from oven and immediately transfer to wax paper to cool. Evenly sprinkle dried cranberries over snack mix. Melt almond bark according to package directions. Drizzle over snack mix. Let stand 20 minutes. Break apart and store in air-tight container. 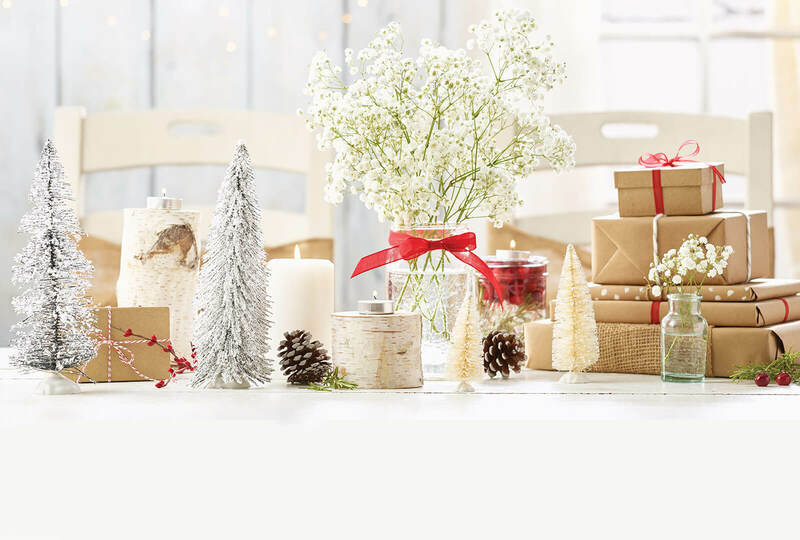 Add a festive touch to your gathering with little effort and investment with these simple centerpiece ideas using materials you may already have around your home. Stick with one or add variety, texture and visual interest to your table by combing several of these ideas. 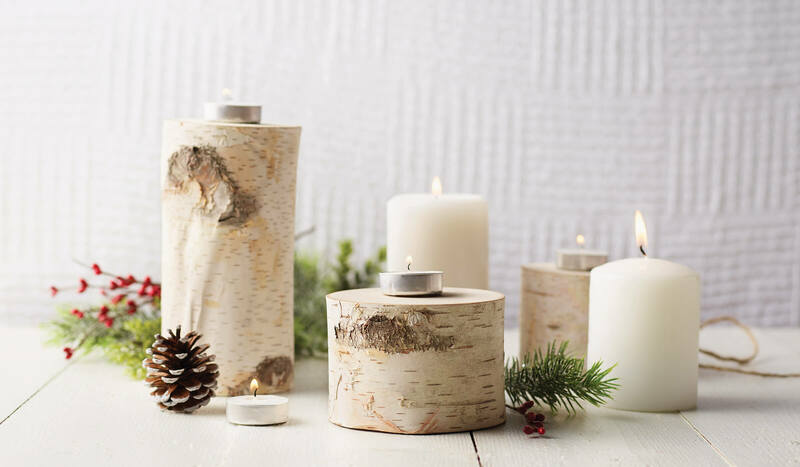 Use a mix of pillar candles and tealights on small tree stumps to add a warm glow to your tablescape. 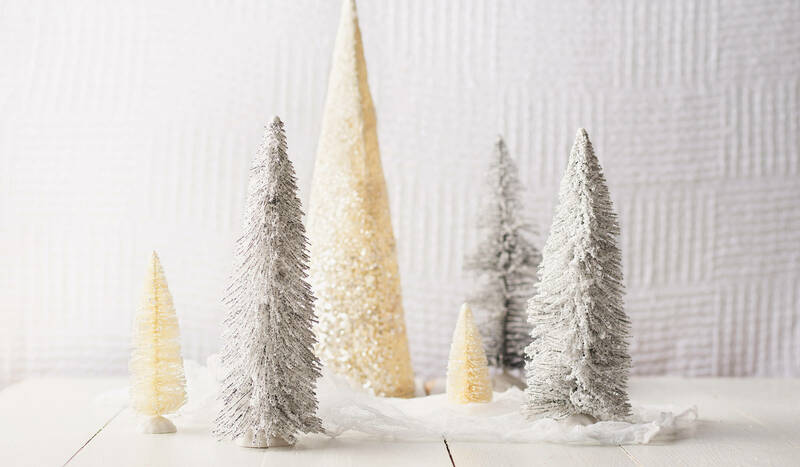 Incorporate items from your own backyard, such as evergreen sprigs and pinecones for color and added texture. Using Mason jars, fresh cranberries, rosemary and tealight candles, add a pop of traditional red and green to your tablescape. Place rosemary sprigs in a mason jar and fill the jar ¾ full with water, add a handful of cranberries and top off with water. 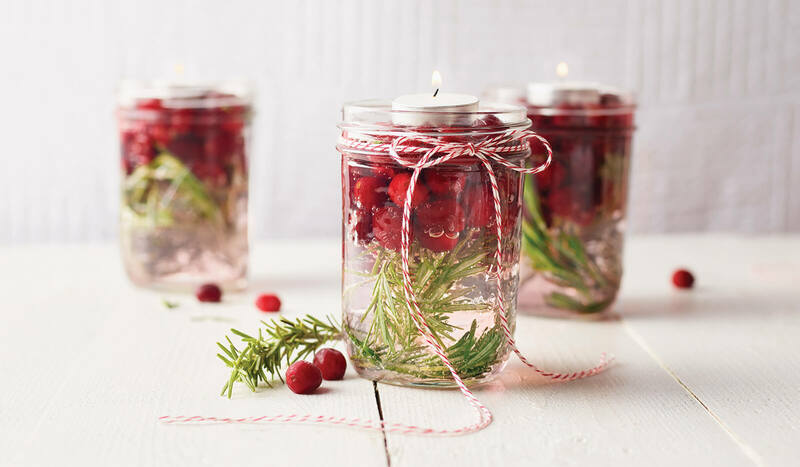 Float a tealight candle on top of the cranberries and tie string or ribbon around your mason jars as a finishing touch. 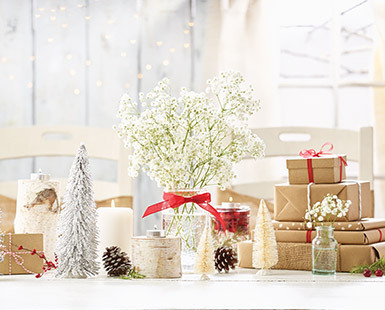 While you may think of Baby’s Breath as an ‘80s wedding bouquet filler, it can make a beautiful, light and airy centerpiece that mimics snow flurries and adds height. 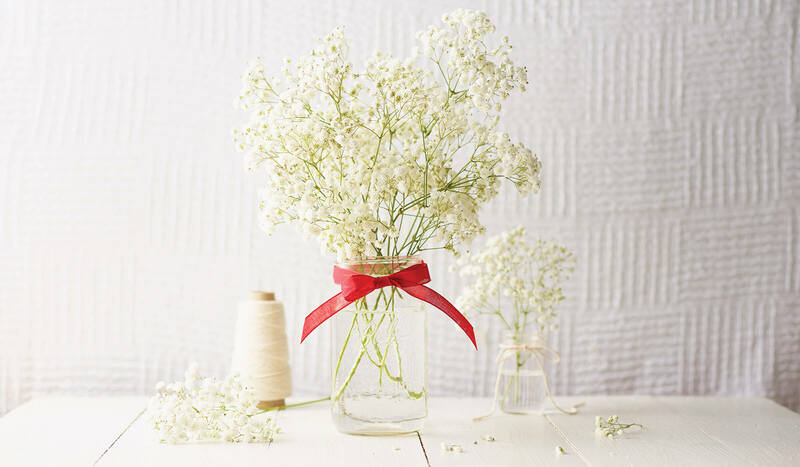 Baby’s Breath is widely available at floral shops for about $3 per stem. Because of its fullness, a little goes a long way. Place in a large mason jar and add a red ribbon for a festive pop of color and a little extra polish. 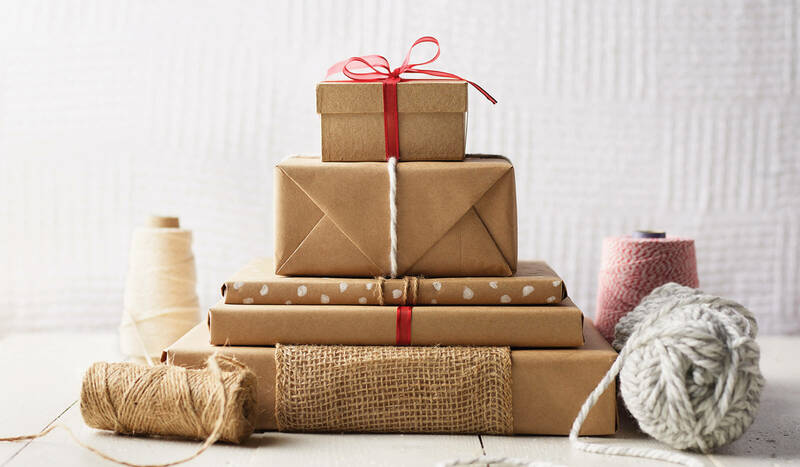 Create a fun, non-traditional centerpiece by wrapping objects from around your home in kraft paper. Books, empty boxes and pantry items are all fair game! Starting with the largest object that will serve as your base, stack your items as you go to ensure they fit nicely together to form your stack. Tie mismatched yarns, ribbons and strings around the packages to add texture and visual interest. Bottle brush trees are becoming an increasingly popular element in holiday decor and because they’re usually neutral and they can be used as decor for the whole winter season. They can be found in the holiday decor area of most department stores or craft stores and come in a variety of sizes and colors. Mix heights and color to create a whimsical miniature forest. 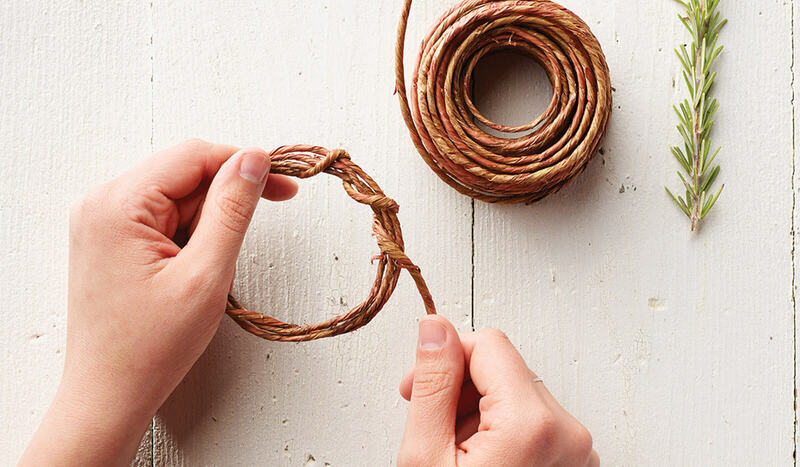 STEP 1: Wind wrapped wire in a circle approximately 3 inches in diameter to form a wreath base. Twist wrapped wire around wreath base to secure and clip excess wire with wire cutters. 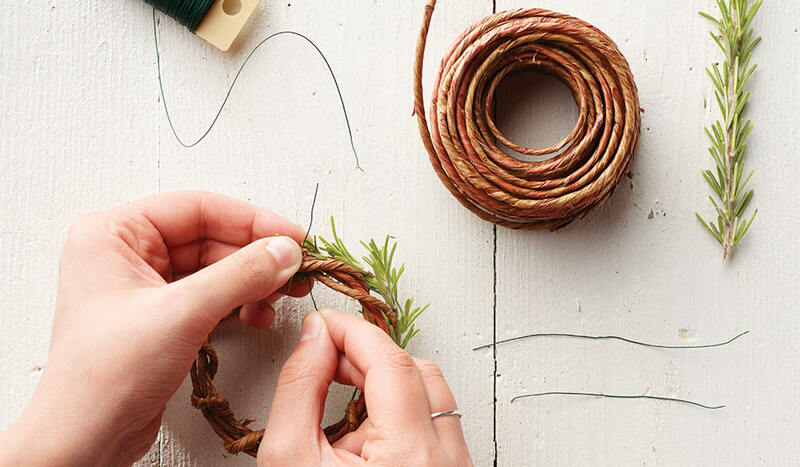 STEP 2: Wrap a sprig of fresh rosemary along the top of the wreath base, tucking the stem end into the wreath base. STEP 3: Cut a few short sections of floral wire to use as you go. 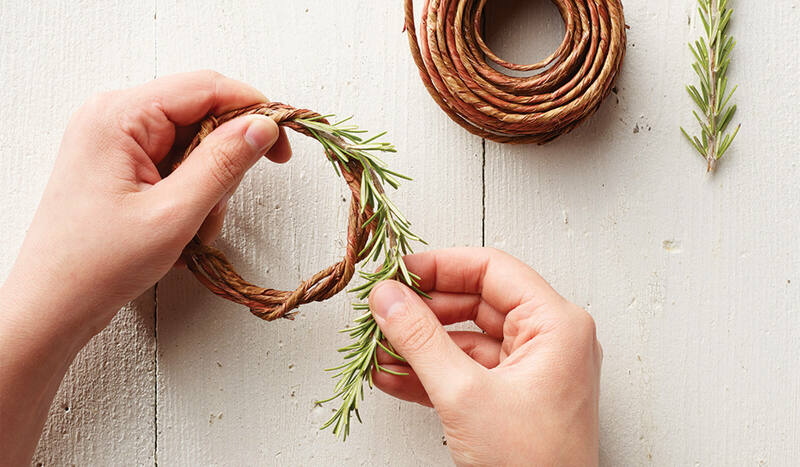 While holding one end of the rosemary sprig to the wreath base, flip the wreath base face down and twist small sections of floral wire around rosemary sprig and wreath base to secure. Trim excess wire and tuck ends into wreath base. Add an additional sprig of rosemary and repeat as needed to cover the wreath base. STEP 4: Create name tags by cutting small rectangles from cardstock and punch a hole in one end. Hand letter guests names on tags using a felt tip pen. 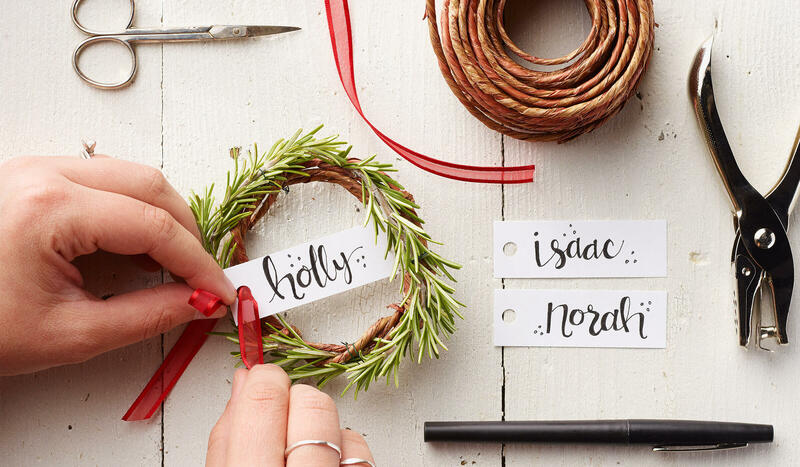 Secure one name tag to each rosemary wreath with ribbon. Tie ribbon into a small bow and trim excess.